Oops. Sometimes I write up a blog and post it on time and feel pretty good about it. Sometimes I come home after work and promptly fall asleep. Yesterday, the latter might have been what happened…so today I’m bringing you the accidental-snooze-late-blog-post. Over the last month or so, I’m noticing that I have a serious self-control issue when it comes to buy green nail polish. With all other colors, I exhibit some rationality in the buying process…with greens? Nope. I see them on blogs and brand pages and think: “This will be the one that looks good on me! Let’s get it!” I’m especially bad with dark greens. I just want that perfect deep piney green. Wherever you are out there, perfect green- come to me! Find me! We will be together forever in perfect polish harmony! 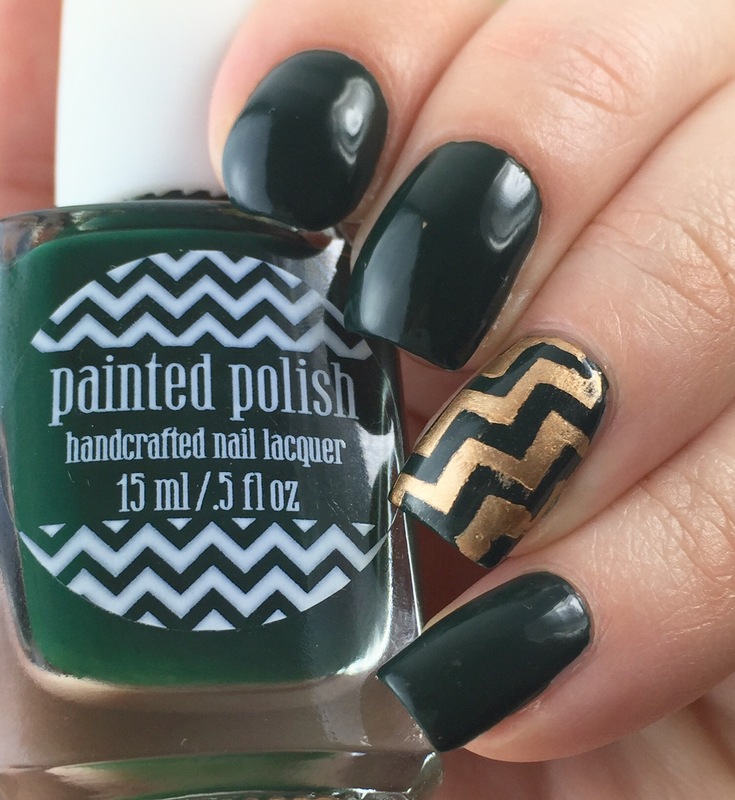 The only problem with my love of dark green polish is that I am a pale person. The palest. So against my papery white skin tone all these beautiful dark greens look black to my eyes (as you can tell, I’ve brightened these photos to try and bring out the green. I know it’s green in my heart, but under the fluorescent lights of my office and in the warm dimness of my living room it just appears black. I have the same problem with any dark purple, red, or blue creme. Pasty skin life problems aside, how was the polish? After all, this was my first polish ever from this brand. (Also guys, it’s “Painted Polish by Lexi” and I am also a Lexi! Aaaahhhhh!) Well 10 out of 10 for glossiness and opacity. This is absolutely a one-coater. 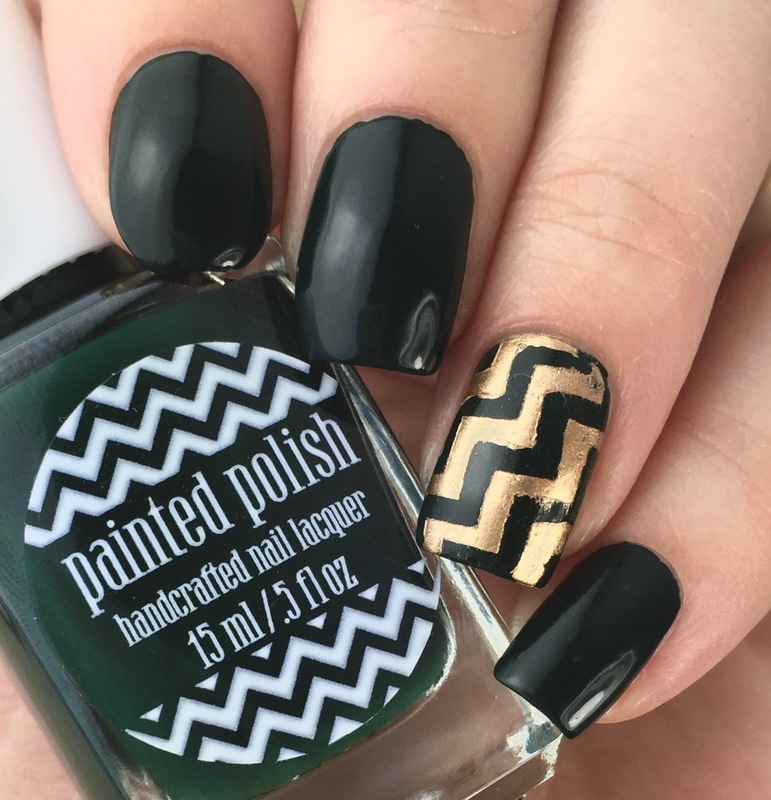 I’m dying to try it for stamping and other nail art, because holy how it is pigmented. Possible because of the opacity, and the fact that I’ve been using a lot of brands with a thicker formula lately, I had some troubles with this. It was a little thinner than I’m used to, so I found it flooded by cuticles (and then was murder to get off of them because I kept getting green everywhere). I think the solution to this is to keep as little polish on the brush as possible when you’re painting. Honestly, you don’t need hardly any for full coverage. My second tip is to reach straight for the acetone when removing. I usually go for a non-acetone formula, but this needs the acetone, otherwise it’ll seem like it stains. I might have panicked a little with my green fingers before I remembered the acetone and got everything off quick and easy. 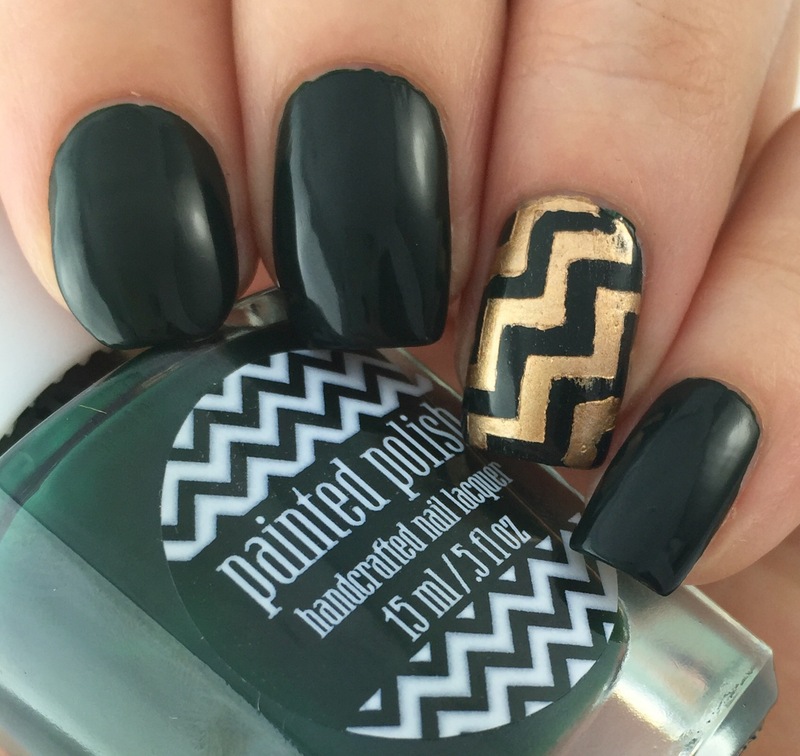 I was really loving the Painted Polish logo on the bottles, so I did a quick accent nail using KBShimmer zigzag vinyls and Maybelline Bold Gold. Between the opacity and quality of the polish and the shopping/shipping experience, I will definitely be purchasing from Painted Polish again. If you’re interested, Woodland Whimsy is still available (in stock!) on the Painted Polish site, along with a bunch of bright, glittery polishes, stripers, and even charms (I am itching to try nail charms next). I have to commend this brand on the shipping. I bought this over a weekend, got a shipping notice the next day, and it was at my house no more than four days later (across the country to the far reaches of RI, that is pretty impressive). I was really impressed that there was no lag between the shipping notice and the Post Office pickup.